Willowgrove is a small town in southern Reaper's March, south of Rawl'kha. 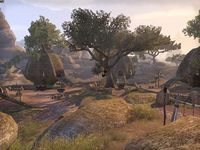 The main economic activity of the town is the production of honeymead, which is exported mainly to Vinedusk Village, but also as far away as Skywatch, in Auridon. Treethane Ranneth rules the village with special care to follow the precepts of the Green Pact. 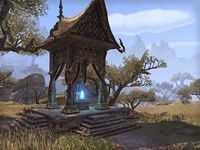 Just outside the town lies Weeping Wind Cave, who is inhabited by Nimriian the Longfang, a Bosmer werewolf, and the leader of the Wolfpack. That cult Nimriian leads, follows the teachings of Hircine, and views Hircine's Curse as a blessing, attempting to spread it among the people of the March. The Lunar Clergy have put a bounty on her head, but the people of the village have been warned to stay indoors at night. The infamous Khajiiti warrior Moon-Scythe and its party were ambushed by Bosmeri defenders and slaughtered just outside the town. Willowgrove Objective: Help the town of Willowgrove remedy a disaster. Willowgrove Wayshrine is located northeast of Willowgrove, just off the road towards S'ren-ja.